Starting Point-Teaching Entry Level Geoscience > Cooperative Learning > What is Cooperative Learning? 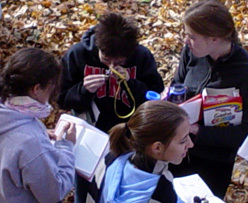 Cooperative learning involves more than students working together on a lab or field project. It requires teachers to structure cooperative interdependence among the students. These structures involve five key elements which can be implemented in a variety of ways. There are also different types of cooperative groups appropriate for different situations. Five key elements differentiate cooperative learning from simply putting students into groups to learn (Johnson et al., 2006). Positive Interdependence: You'll know when you've succeeded in structuring positive interdependence when students perceive that they "sink or swim together." This can be achieved through mutual goals, division of labor, dividing materials, roles, and by making part of each student's grade dependent on the performance of the rest of the group. Group members must believe that each person's efforts benefit not only him- or herself, but all group members as well. Individual Accountability: The essence of individual accountability in cooperative learning is "students learn together, but perform alone." This ensures that no one can "hitch-hike" on the work of others. A lesson's goals must be clear enough that students are able to measure whether (a) the group is successful in achieving them, and (b) individual members are successful in achieving them as well. Face-to-Face (Promotive) Interaction: Important cognitive activities and interpersonal dynamics only occur when students promote each other's learning. This includes oral explanations of how to solve problems, discussing the nature of the concepts being learned, and connecting present learning with past knowledge. It is through face-to-face, promotive interaction that members become personally committed to each other as well as to their mutual goals. Interpersonal and Small Group Social Skills: In cooperative learning groups, students learn academic subject matter (taskwork) and also interpersonal and small group skills (teamwork). Thus, a group must know how to provide effective leadership, decision-making, trust-building, communication, and conflict management. Given the complexity of these skills, teachers can encourage much higher performance by teaching cooperative skill components within cooperative lessons. As students develop these skills, later group projects will probably run more smoothly and efficiently than early ones. Group Processing: After completing their task, students must be given time and procedures for analyzing how well their learning groups are functioning and how well social skills are being employed. Group processing involves both taskwork and teamwork, with an eye to improving it on the next project. Similarly, Kagan (2003) has developed the easily recalled acronym PIES to denote the key elements of positive interdependence, individual accountability, equal participation, and simultaneous interaction where the latter 2 components encompass the final three described above. There are a variety of techniques that can be used to promote one or more of the elements of effective cooperative learning groups. The list below is intended to be representative rather than exhaustive. Big Project: This is the usual motivation for assigning students to work in groups in the first place, a learning task that a student cannot accomplish alone in a reasonable length of time. Often these projects are more interesting and can teach more than simplified versions. See examples of projects. Jigsaw: Divide the group into specialists on particular areas of the material to be learned. Specialists in one area work together to develop expertise in their specialty, then return to their original group to combine their new expertise with those of experts on other aspects of the material to finish the project. For a complete description of this technique, see the jigsaw module. Peer Review: Providing students with the opportunity to learn how to provide and received constructive feedback is an important part of process of conducting research. The peer review module describes how to use student pairs or groups to help each other with written work. Individual Grades: Individuals can be given quizzes and exams. Likewise, parts of group projects can be done independently or randomly drawn students can provide oral/written reports on group results. Within-Group Peer Assessment: Another way to discourage students from letting others do their share of group work is to have students (anonymously) rate their group mates and include the average rating from all of a student's group mates as part of his or her grade. See the assessment of cooperative learning page for more information about how to encourage individual accountability. Student Roles: Encourage students to interface with multiple parts of the project by assigning roles that require interaction with the rest of the group as they work, such as checking data, keeping the group on task, or keeping records. Online Bulletin Boards: If students have limited time to meet face-to-face (common on commuter campuses and online courses), the instructor can set up an online asynchronous bulletin board for students to post what is essentially an e-mail to the group. Many forms of classroom management software such as WebCT and Blackboard make this possible. It also allows the instructor to monitor interaction. Discussion: It may be helpful to explain to your students why they are working together and how the group can promote their learning. Practice: Give students time to learn to work together before expecting spectacular results from cooperative learning. If you assign students to groups early in the term and let them do a series of projects together, not only will they learn each other's schedules and particular strengths, they will learn to ask and answer better questions of each other about their projects and progress. Reflections: It may be worthwhile for group members to write individual, private reflections on their learning after the project, citing which parts of the project and which group members contributed to various discoveries, then bring the group back together to discuss the project. Fink (2003) describes this process of 'learning how to learn' as one of five key components that contribute to significant learning experiences as it enables students to become better students, inquire about a subject and construct knowledge and become "self-directing learners." (p 50-55) For more information about self-reflection in the learning process, see the Cutting Edge website about metacognition.